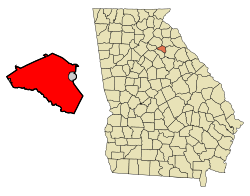 ^ Athens-Clarke County Unification History Archived 2010年1月17日, at the Wayback Machine. ^ ACC Online Archived 2010年9月24日, at the Wayback Machine. ^ Athens' "Really Really Free Market" Archived 2009年9月21日, at the Wayback Machine. ^ Phil Hall (2009). The History of Independent Cinema. BearManor Media. p. 215. ISBN 1593933355.